Jose grew up in the Tierra Vida community. His family was one of the first to move into the apartments back when they were first built. His is currently attending Columbia Basin College and is working towards a degree in social work. 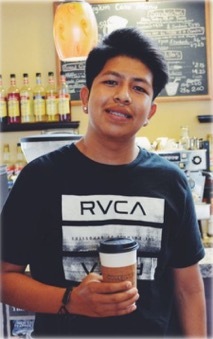 In 2015 Jose went through our youth barista training program and excelled. In 2018 when we heard he was looking for part-time work we were excited to bring him on in the Café. After working with us for a little over 6 months Jose took the opportunity of joining ESD in the Rec Center, working with the kids in the After School Program. Jose is now able to mentor the boys and girls of the Tierra Vida Community. He comes in every morning before school to get his cup of coffee, and expressed gratitude for this place giving him the job that helped him transition into the work that he really wants to do; and that’s serving the youth in his community.